A few years back I read about a tree named the Snowflake Tree which yields edible flower buds. Last year, Thai vendors at the Mustang Market near St. Pete who had eaten the cooked flower buds in their homeland as children told me to look out for it. They called it Taang Luang. Well, I did some research... The book Wild Edible Plants of Assam (India) tells us that the "flower buds are eaten cooked by Garos and Bodos in (the) Kamrup area." On a recent guided tour at ECHO, the public edible gardens in North Fort Myers, I saw a tree labelled "Snowflake Tree" with buds adorning the branch tips! A quick check online and it was confirmed... I had found the elusive Taang Luang! Lucky for us edible flower hunters, each umbel is said to contain "25-45 flowers." "It "is indigenous to northern India, southern China, Vietnam and Thailand" as well as "Nepal, Bhutan, Bangladesh, Myanmar, Laos, Cambodia." The very large, beautiful, deeply lobed (pseudocompound) leaves are the reason that the most common name in the U.S. is Snowflake Tree. The tight clusters of small, fragrant, white to yellow flowers mature into small 1/2" round fruits. I have found websites from China, Singapore, and India that all mention that this tree is used medicinally, but they gave no details. I will have to delve deeper. The inner pith of the stems has been made into hats in India. CAUTION: The fruits are poisonous, being used as a fish poison in India. 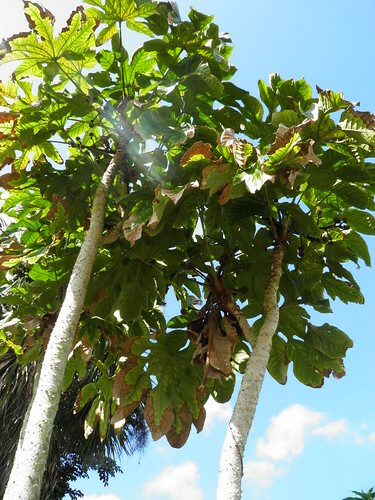 Be careful when handling the leaf stems (petioles) or when leaning on the trunks as they have small sharp spines on them. CAUTION: The fruits are used as a fish poison in India, and should be avoided! Be careful when handling the leaf stems (petioles) or when leaning on the trunks as they have small sharp spines on them. CAUTION: The trunks have small sharp spines on them. SMR GROWERS: On their website they mention that they sell "the selection "Micholitzii" which has newly emerging leaves that retain white downy hairs then become glossy." 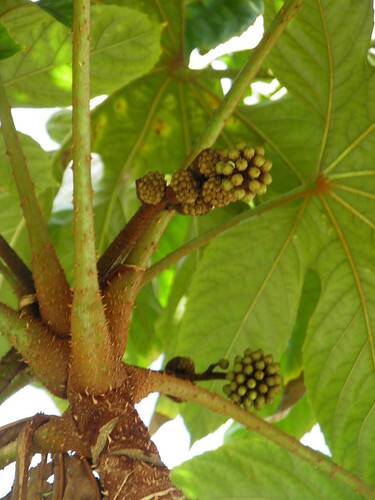 "Antiproliferative Triterpene Saponins from Trevesia palmata," an article in the Journal of Natural Products, Italy, 2000.